Windows Security Log Event ID 4627 - Group membership information. This is the only event of it's new Group Membership subcategory. 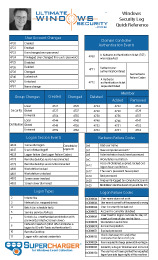 One or more of these events are logged whenever a user logs on or a logon session begins for any other reason (see LogonTypes on 4624). This event documents all the groups to which the user belongs. This event is not really an event per se but a point-in-time documentation of the user's membership at the time of logon. Identifies the account that requested the logon - NOT the user who just logged on. Subject is usually Null or one of the Service principals and not usually useful information. See New Logon for who just logged on to the sytem. If a user is member to too many groups to document in one event Windows will log multiple instances of this event. This is where all the groups are listed to whom the user belonged at time of logon.